24. A paradigm for marketing software, comprising: a marketing company that markets software from a plurality of different independent and autonomous software companies, and carries out and pays for operations associated with marketing of software for all of said different independent and autonomous software companies, in return for a contingent share of a total income stream from marketing of the software from all of said software companies, while allowing all of said software companies to retain their autonomy. The application also includes method claims of using the paradigm. The BPAI (Board) found that the claims satisfied the requirements of 35 USC 102, 103, and 112, but that they were not patentable subject matter under 35 USC 101. §101. Whoever invents or discovers any new and useful process, machine, manufacture, or composition of matter … may obtain a patent therefor, subject to the conditions and requirements of this title. Although difficult to find within the text of the statute, the Board found that Section 101 requires that a claim either have a “useful, concrete, and tangible result” or “transform” something into a new physical state. Because Ferguson’s claims don’t fit either of these categories, the Board held that the claims were abstract and thus unpatentable. In its decision, the Board followed the rules set forth in the PTO’s Interim Guidelines on Subject Matter Eligibility. Ferguson’s appeal is a head-on challenge to the PTO’s guidelines — arguing that the limited tests proposed by the PTO were never intended by courts to be ‘exclusive test’ and that his claims are, in fact, patentable subject matter. Oral arguments are set for December 5th, and a decision likely in February or March of 2008. That decision may finally provide a clear analysis regarding the patentability of business methods. ** People Magazine Byline: If you remember, Scott Harris is a former major partner at Fish & Richardson. He left the patent litigation giant after some of Fish’s larger clients (Google) complained about being sued for infringement of patents invented (but no longer owned) by Harris. Fish has been sued by owners of a Harris patent (and now Harris himself). Their allegations against the firm include tortious interference, defamation, and the wrongful witholding of wages. Interestingly, Jenner & Block is representing another non-practicing patent plaintiff, PA Advisors, who is suing Fish clients (Google). . . [PTT] [Patently-O][Harris Counterclaims]. Interestingly, Tom Woolston (owner of MercExchange) was also a Fish & Richardson patent attorney and prosecuted his patents while at that firm. John Phillips, managing partner of Fish & Richardson’s San Diego office is a co-owner of that company. Bilski: Bilski also involves business method patenst and was argued on October 1, 2007. In the audio, Judge Moore takes seriously the seemingly novel concept that Design Patents must also fit within the the 101 guidelines. LINK: At his excellent blog, Peter Zura uncovers three recent BPAI decisions that limit the patentability of software. Ex Parte Rodriquez et al. (link) (Computer instructions are not patentable as instructions (dicta)). Click, Insert, Symbols, “¢”, then Insert at the bottom and Close. Typewriters with that key are patented and the patentee wants too much money. But thank god someone came up with the idea and was generous enough to disclose it to the public or nobody would ever have come up with it. I think its harder to swallow the 103 and 112 satisfaction than the 101 rejection. I mean, any company performing services for a share of the sales would be prior art here, especially considering the new “common sense” and “predictable results” examination guidelines. I guess the BPAI decision predated the KSR v Teleflex by SCOTUS. I wonder if this ever gets back to prosecution if the new rules will kill it on 103. It’s not just Fish, patent lawyers have long skirted the ethics of representing multiple clients in the same art. This is especially true in the area most loved by this chat room – patent prosecution. But don’t try to gore that ox here. How should the CAFC resolve this matter? Clearly the first Jepson is the way to go since it recites after the transitional phrase an element emphasizing the “Wow…look what we did” factor. peanut gallery, the statement of “We will only get a sensible 101 opinion when the claims at issue clearly fall into a statutory category, and are clearly novel and non-obvious” makes no sense. If the “claims at issue clearly fall into a statutory category”, how will this help clarify 101. Based on your proposition, it would already be clear and decided that the claims are statutory. The only thing a decision on something like that would do is either confirm that what is statutory still is or move something that is statutory into the non-statutory class. Is that what you meant? The only way we will get something definitive (if the courts really want to do that) is with something that is currentlly in a gray area. Then they can show where the line might be. Unless they want to completely strick down the idea of buisness method patents, then they need to address a claim which appears to be statutory & say explicitly that such claims are not. Same thing went through my mind. I think it’s highly likely that the Board wanted to tee up the 101 issue alone so that the Federal Circuit would directly address it. Their claim/position is so absurd that these facts will provoke the court to make extreme statements that will lead to bad law. We will only get a sensible 101 opinion when the claims at issue clearly fall into a statutory category, and are clearly novel and non-obvious. Until then, the opinions will mix up the issues. Agree with all that there’s no way these claims should survive 102/103 challenge. But we all know the PTO resources and ability to find “real” prior art stinks, especially in the business world. And wow – what badly written briefs. Totally agreed. Putting all this aside, read Comiskey. This appeal is a straightforward application of the holding in that case. On that point, I think the comment by pds above about Comiskey emphasized the wrong word in the decision. The key word is “require,” not “could.” In other words, the Federal Circuit gave Comsikey the benefit of the doubt: that by reciting “modules” and such in his claims, each claim element and function recited in those claims definitively and necessarily required a machine under 101. This proposition, that the entire scope of the claim must be patentable under 101, is the same as the prospect that anticipation and obviousness look to whether any embodiment within the scope of the claims is anticipated or would have been obvious. (And this proposition rejects Ferguson’s/Harris’s argument to the contrary.) If any part of your claim is unpatentable under 101, 102, or 103, the claim is out. Ferguson’s process claims are nearly indistinguishable from Comiskey’s unpatentable process claims from the 101 perspective. They are both primarily mental process claims, although Ferguson may have some “abstract concept” elements thrown in, like the step of obtaining a share of the profits. In any case, Ferguson’s process claims, even if (1) they have practical application, are (2) not necessarily tied to a machine, manufacture, or composition of matter: both elements are required under Comiskey. These claims are out until the S.C. says otherwise. Ferguson’s “paradigm” claim, as the gov’t rightly pointed out, is not a “machine”: a company is not a machine. This claim is out. And I agree, as business method patent goes, it’s really quite fantastic and robust. Interesting that Fish & Richardson could find itself in a lot of deep water if anyone decided to “fish” into how much confidential information is bleeding into interests competing against their clients. see, /media/docs/2006/03/MercAAU.pdf p. 13-14 re :google page rank, licensing as a ‘net benefet to the national economy” Note also that the license of the patent right did not hinder commerce – or result in any reduction in jet size, swagger, or chasin tail potential for sinrgy or brin. Just cause some jackaz wants to patent cold fusion – doesn’t mean to ban all ‘physics’ patents. Same applys to harris. A paradigm is worth only 20 cents. Besides I already have a patent covering a method of claiming paradigms. YetAnon & Mark Nowotarski :: Yahoo! acquired Overture *for* U.S. patent # 6,269,361 for 1.63 BILLION dollars (2003 dollars) … the patent covers placement of advertisements … Yahoo! then went on to acquire a few million Google shares and some licensing led to more!! there is an example and in this case one example with very high amplitude … dont recall any litigation, either. is this a benefit to society? well. measured by profit-seeking companies that are dominant (speaking of Google & Yahoo), yes. Where did you see a copy of the application? I couldn’t find it in PAIR. I’ll forward a bill to the Queen. How we can preclude search about the business method validity and helpful in country economy. I have just finished rolling round on the floor laughing at the application. Trying to be serious for a moment – if the court even for a moment considers this to be patentable subject matter then we might as well all go home and patent anything and everything we do – this is on a par with a method of using loo paper. Personally, I work under UK and EP case law. A UK examiner would in all likelihood read this refused to search it and then offer the applicant an immediate hearing. This would have been refused and the applicant would end up in the HIgh Court where the Judge might have deliberated on the case for about 30 seconds before throwing it out. Even under the slightly more liberal EPO dicta I would be surprised if they would search it. The sad part of this is that some posters appear to think that Business methods should be patentable – Do you also think that methods of treatment should be patentable as well. If that i sthe case would you want to be the patient on the operating table in a life threatening condition whilst the Doctor was trying to get hold of the patent holder to get approval for that operation. I disagree with the Board too with regard to claim 1. Certainly 102 and 103 problems, but I don’t think that there is a 101 issue. Can you provide any example of Google licensing its business method patents for a net benefit to the national economy? I disagree with the Board with regard to claim 1. Isn’t “obtaining a share of total profits” more than just an abstract idea? Money is exchanged. Isn’t this useful? (obtaining profits). When money is exchanged, there MUST be some physical transformation somewhere (either cash is exchanged or banking servers adjust a balance stored in a physical storage medium). However, I don’t think the CAFC will see it my way. Some of us here actually prosecute business method and software patents for a living (gasp). I guess I can always go into litigation. oops, so the board wanted the slam dunk. SF, re: “… unless the examiner wanted a quick couple of counts and knew that the 101 rejection was a slam dunk.”, the examiner did not make the 101 rejection (though they should have!). They made the 112, 102, 103 rejections. They didn’t take teh say way out. The board revered all these & made the 101 rejection, according to the remarks, above. Re: Are “bad facts” going to make for “bad law” here? I am afraid that they will. Are “bad facts” going to make for “bad law” here? I am afraid that they will. Jim H., re: “Was the reason for reversing the rejections because the examiner should have never reached the point of entertaining 102, 103, and 112 rejections?” If that was their reason, they are wrong. An examienr is supposed to make ALL rejections that are appropriate, prefereably as early in prosecution as possible. So, the claims should be analyzed for 102, 103 & 112, as well as 101 from the start. As to the 101 issue (and clearly someone screwed up in that they are not still rejected under 102 and/or 103), and just speaking for myself, WHY should a claim like this (or most buisness method claims/cases) even be statutory?? What did they invent?? NOTHING! If they want to patent the software that perfoms this “paradigm”, maybe that could be statutory. Maybe (depending on the form of the claims). At least you can argue that the software (in some form, anyhow) is something that can be called an “invention”. But this, and other ways to run a buisness (or do taxes, or white a screenplay, etc., etc.) are not “inventions” in the way the word has been interpreted for a couple hundred years. The Board reversed the 102, 103, and 112 rejections, and added the 101 rejection. Was the reason for reversing the rejections because the examiner should have never reached the point of entertaining 102, 103, and 112 rejections? How did this get by 103? This kind of thing, albeit using crops rather than software, has been known for at least 2000 years. After reviewing the BPAI decisions of Ex Parte Kinzhalin, it looks like BPAI didn’t read Comiskey too closely. In view of the recently decided case, In re Comiskey, — F.3d —-, (2007 WL 2728361) (Fed. Cir. Sept. 20, 2007), we must consider the statutory sufficiency of the recited claims under 35 U.S.C. § 101. More particularly, apart from the word “automated” in the preamble which, at best, merely tangentially suggests a machine, claim 1 does not recite any steps that necessarily involve machine implementation. Whereas the BPAI is looking for something “that necessarily involve machine implementation,” Comiskey stands for the proposition that “under the broadest reasonable interpretation,” if a claim **COULD** require use of a machine (e.g., a computer), then the claims are deemed statutory under Section 101. As such, I think the BPAI is using a much more stringent test (i.e., “necessarily involve”) versus the more relaxed test (i.e., “could require”) of Comiskey. As for Ex Parte Rodriquez, the BPAI held that a “computer readable medium” claim did meet Section 101 because the specification described that the medium included “wireless communications links” (i.e., a signal under transmission). Referring back to Comiskey, I think they got it wrong because Comiskey stands for the proposition that all possible subject matter covered by a claim does not have to be statutory under 101. Instead, if the claim could cover statutory subject matter, than it meets the requirements of 101. In this case, a computer readable medium could be a disk or memory and would be patentable. Unlike 102, in which an applicant is entitled to a patent **unless** one of subsections of 102 kicks in, section 101 does not include the “unless” language.” Whereas the existence of just one piece of anticipatory prior art, per one of the subsections of 102, is enough to prevent a patent for issuing, with section 101, it is written only to describes what constitutes a statutory subject matter but does exclude a patent from issuing if the claim also covers non-statutory subject matter. I believe that Comiskey inherently recognizes this difference in how the claims are written. As for the Harris patent … I cannot believe he, with a straight face, is trying to assert that piece of junk is patentable. It is people like him that give patent attorneys a bad name. He’s patenting a marketing company. Has there not been a marketing company that markets a product and gets a share of the royalties? Good grief. The Federal Circuit should affirm without discussion. Do you think Judge Pauline Newman would show pity on Harris (if she wins this matter as a luck of the draw)? RE: your request for a definition: Back in the day, I did actual engineering work for a small company and did so as an engineer. There came a time when one of the owners sons, which distinction also qualified him to be vice president of something or other, became enamored with PowerPoint and began giving presentations on paradigm shifts. During one of, or perhaps soon after one of these talking tos, I looked quizzically at one of my coworkers who immediately understood my own confusion and immediately pulled two 10 cent pieces from his pocket and, while rubbing them together between thumb and forefinger, began moving his hand from side to side. But my Webster’s New College Dictionary says a paradigm is 1. A list of all the inflectional forms of a word taken as an example of the conjugation or declension to which it belongs. 2. An example. Wow – Ferugson’s briefs are really bad. Maybe he had very little time to write them. Maybe he’s intentionally throwing the game. Those excuses aside, I would expect much, much better from a (former) senior guy at F&R. I could get a better brief out of a solo practitioner charging $100/hour. Add (4): the reply brief refers repeatedly to the “Cominsky” [sic] case. I’m guessing Harris is a Chicago Cubs fan, and can’t escape the habit of butchering this name. One can only hope. Watch the PTO backlog drop if that happens. It’d save the rest of us a lot of pain. I don’t think so. First, a corporation is a fictional entity capable of owning property. Second, can a physical thing or machine own property? I think not. Boy, isn’t a “fictional entity” such as a corporation is close to being an “abstract idea”? See my comments above. I think this argument defies logic. I cannot take this anymore. And this guy is a lawyer? And former partner of FR?! He should have contacted Kirkland Ellis and had them write the brief (see any brief of GSK). Has Harris been spurned by Fish and is he seeking retaliation against his former firm (and his former client through agency principles)– by seeking to make worthless many patents of the clients of his former firm — by getting business methods held to unpatentable be 101? Is he trying to ruin it for many software companies? His brief confirms what I’ve heard on the street about Fish – the talent is not at the top. I really didn’t see where the USPTO addressed this. Thanks again Dennis. Great article and topic. P.S. Ms. Rai is still cute. After looking at this case and reading the brief, I can only ask: Is Scott Harris just a bad lawyer, or is he really an anti-patent mole in a conspiracy with the PTO to reduce patentable subject-matter? 1. If Harris is a pro-business patent guy, what in the world is he thinking bringing this case at this time? The Federal Circuit just cut back on 101 patentability, and the Supreme Court looks to be even more eager to throw State Street out permanently. 2. The brief has so many glaring defects I cannot list them all. On form alone: (1) the table of authorities is all wrong and plainly non-compliant; (2) the jurisdictional statement cites the wrong statutory authority (it is 28 USC 1295(a)(4)); and (3) the argument is riddled with allcaps, which is a stylistic no-no. This brief reads as if it was written by a pro se petitioner from the MSPB, not a former partner at a national firm with regular appearances before the CAFC. Pro se petitioners with bad briefs usually lose. b) failing to pay the plaintiff of said infringement lawsuit $100 million within 30 days of fending off said infringement lawsuit. Now it’s lose-lose for y’all. I do. There are a number of instances where patents have been an integral part of the commercialization and licensing of important new inventive methods of doing business. Google, Ebay, PriceLine and Amazon.com are all examples in the consumer space. Pay as you drive auto insurance, EFTs, stable value COLIs, and 401k disability insurance are examples from the financial services field. How is the CDW catalog not a 102 reference? “Paradigm” is to the 90s as dayglow vests and synth-pop are to the 80s. 1. A paradigm for extracting damages from someone for disputing the meaning of the word paradigm. Huh?!? How is this not obvious to anyone who has ever marketed for multiple businesses and taken a share of the revenue? This is outrageous. If this “paradigm” is patentable, then every business plan is patentable. Is that really the brief that Harris filed? What a POS! There is absolutely no way he wins this one. I do. These patents make bigtime ultra-clever lawyer/”inventors” like me a bunch of cash. Some of that cash will surely trickle down to the little people. For example, if I’m feeling confident that my bank account is healthy, I might just buy that extra falafel from the immigrant fellow down the road. This is how America became what it is today. I enjoy the term “autonomy” in the claim, which would be pretty cool to define during a Markman hearing. Looking beyond their clear value to patent lawyers with bills to pay, does anyone really believe that business method patents have been of any net benefit to our national economy? This might just be the case that lets the Supremes finally drive a stake deep enough into the heart of State Street to bring this chapter to an end. Forget subject matter (although last time I checked a “paradigm” was just “a thought process”), how the heck is this not anticipated or obvious! It’s all spelled out in the spec, baby. One of ordinary skill in the art of making $$$$ would know exactly what I mean. Forget subject matter – how is this not anticipated? Regsoft, Simtel, and countless other shareware marketers have been practicing this “paradigm” for years and years. 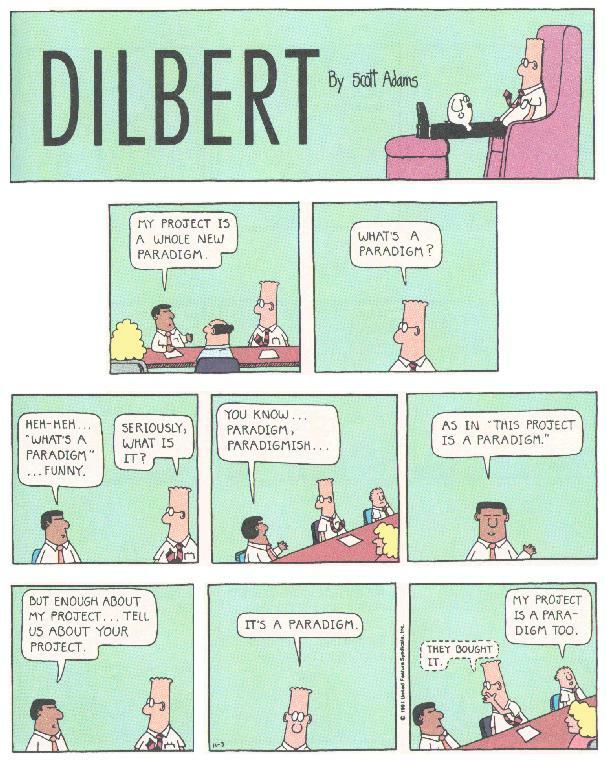 Building on Anonymous’s argument that a paradigm is not a method, the claim seems pretty indefinite to me – what are the “operations” of marketing? Advertising? Listing? Brochures? In other words, if regsoft doesn’t anticipate, how would we ever know that from this claim? Scott Harris is a rather silly and evidently self-absorbed person and I look forward to watching this ongoing soap opera. Today I filed my application on the paradigm of celebrating Scott Harris’ antics in the comment section of a patent blog, using a combination of sarcasm, snark and traditional derision. Never fear: my licensing fees will be very reasonable (at first). What is “a paradigm” — why not give yourself a snowball’s chance and cast your invention in a recognized category. Who would infringe a paradigm? Since they never got the chance with Metabolite, I have to think that the Supremes would love to get this case, which presents solely the 101 issue.